Pyramid TimeTrax EZ employee time clock system designed for small business with less than 25 employees. Time clock connects directly to your PC via USB Port. Windows based TimeTrax software will calculate regular time and overtime hours (including CA overtime) based on a few simple work rules. Complete system includes badge swipe terminal, TimeTrax EZ software, cable with USB adaptor and 25 employee badges. Pyramid TimeTrax EZ Ethernet time clock system comes ready for 50 employees (upgradable to 500). Software can manage multiple swipe terminals connected to your LAN or WAN network allowing employees to punch in and out from any time clock. 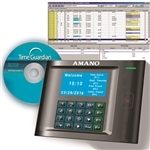 Complete time clock kit includes swipe terminal, software, and 50 employee badges. Amano TimeGuardian MTX-30P Proximity Package is Network Ready. Features include customizable punch rounding rules, unlimited departments, automatic terminal polling, schedules and flexible pay policies including holiday tracking. Employees can transfer departments at the clock or check their punch information.